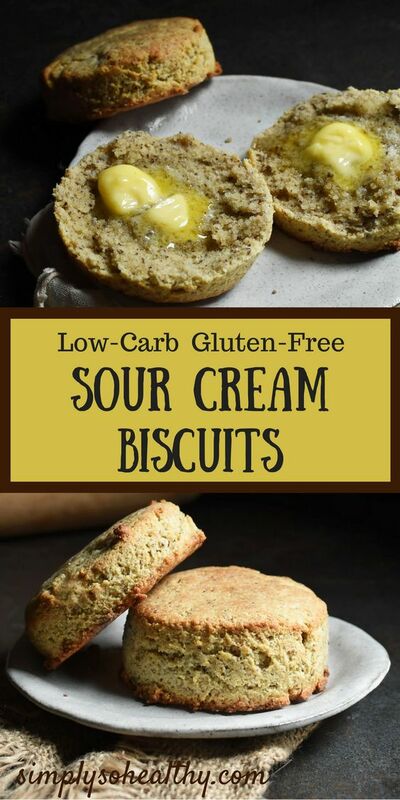 These Low-Carb Sour Cream Biscuits are the best! Even better, they can be part of a low-carb, ketogenic, LC/HF, Atkins, gluten-free, grain-free, and Banting diets. Creating a low-carb biscuit recipe wasn’t easy! I have been working on this since we started our blog, and have created a lot of good recipes, but none that we felt were good enough to share with all of you. There are a lot of challenges with low-carb biscuits. I love almond flour, but it doesn’t taste the same or act the same as wheat flour. In my early batches of biscuit recipes, I tried to cover up the subtle taste of the almond flour by using garlic, cheese, and herbs. In this recipe, I instead try to add a bit of nutty wheat-like flavor by using ground flax meal. 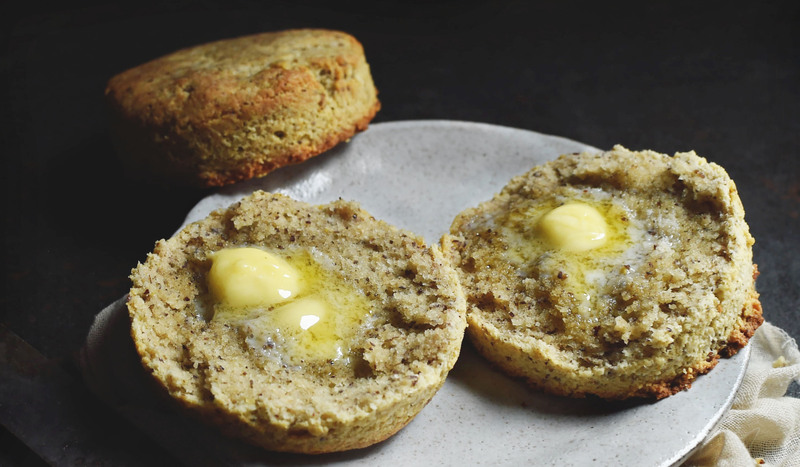 The flax (in addition to the egg white) also adds a stickiness that helps hold the flour together–otherwise, the biscuits would just crumble in your hands. I know this for sure because I’ve done it. I was thrilled when I pulled these biscuits out of the oven. Even before I slathered one with butter, I could tell they were something special. The fragrance wafting from the oven reminded me of the biscuits my mother used to make. The bottoms were golden brown and the tops had a nice firmness when tapped. Breaking one in half revealed a tender middle, just waiting for a pat of butter. The best part about the biscuits is the taste. Somehow, all of these ingredients combine to make a flavor similar to the biscuits my mother made. These biscuits are the perfect low-carb biscuit to serve with sausage gravy or as chicken and biscuits. One notable difference between these biscuits and wheat biscuits is that they are super-filling. Almond flour contains so many more nutrients than wheat flour and our bodies know it. While I might eat two or three wheat biscuits in a sitting, one almond flour biscuit more than satisfies me. Because of this, I have the recipe as a small batch, just making about 4 biscuits. The recipe can be doubled, if you need more biscuits. 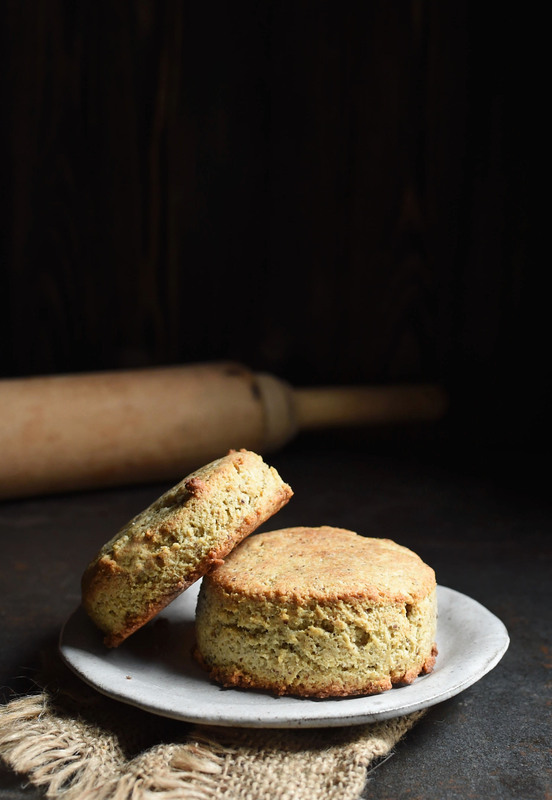 Another difference from traditional wheat flour biscuits is that these low-carb biscuits don’t rise much in the oven. They do rise a slight amount, but for the most part, the thickness they are when you put them on the sheet is the thickness they will be when they come out of the oven. I am excited about the potential to use these biscuits in future recipes. I’m so happy I have found a biscuit recipe that I love and I hope you love it too! Enjoy! Preheat oven to 400º Fahrenheit. Line a baking sheet with parchment paper. In a medium mixing bowl, whisk together the almond flour, ground flax seeds, xanthan gum, baking powder, salt. Cut the butter into the dry ingredients using a pastry blender. Mixture should appear mealy. In a small bowl, whisk together the sour cream and the egg white. Stir this mixture into the dry ingredients. Transfer mixture to a piece of parchment paper. Shape into a disk about 1/2 inch thick. Cut into desired shapes and place each biscuit onto the prepared baking sheet, allowing at least 2 inches between biscuits. Bake biscuits in the preheated oven for about 10-12 minutes. Larger shapes will take longer. Yes, these biscuits make the cut! I wish people could taste things over the internet. If they could, this would be one of my most popular recipes. When I was working on them, I knew when I had the dough right. It smelled like “real” biscuit dough. This biscuit recipe really lends itself to customizing. Have fun with adding herbs to make it your own. I just tasted these biscuits at my nieces! Best bread/biscuit recipe I’ve tasted since starting Keto. But looking at the amount of carbs it will have to be a once in awhile treat. Thanks for sharing it! I’m glad you enjoyed them! I try to keep the number of carbs down as much as I can, but I also want everything to taste good. It’s a balance. There are 3.4 net carbs in each biscuit. Thanks for checking out our site! I cant have flax in the house because of my daughter’s allergy. Can you recommend a replacement? You can probably just replace it with almond flour. The biscuits will taste slightly different, but should still be good. I haven’t tried this substitution, but I don’t see why it wouldn’t work. Let us know! Maybe you can make it more often and indulge in half a biscuit instead of the whole to keep the carb level down. Just a thought. I love biscuits too but am not quite sure how to make a keto gravy or any gravy for that matter. I’m originally from India and so there is much learning to do with these new adapted tastes! Great idea! I have a recipe for sausage gravy on the blog. I know this is Americanized Indian food, but you might be interested in my recipe for chicken tikka masala. It has a gravy-like base. (I’m not sure you would want to put the tikka masala over biscuits, though). I do like to use my tortillas as a substitute for naan. My husband and I have converted to KETO eating and I have been trying for 9 weeks to find some type of bread substitute for my husband for quick breakfasts. This is the WINNER!! I made these with sausage and cheese with Griffin’s Sugar-Free syrup and just handed my husband one and he just gave me a high-five, a little jig and asked for another one. Awesome job and thank you so much for sharing this awesome recipe!! Thanks for your awesome feedback! I love the flavor of these biscuits. I’m glad this recipe is helping you stay keto! Can I grind up my almond flour to make if finer if I don’t have super fine almond flour? That should probably work. The consistency of the flour I use is powder-like. I grew up in the mountains of Appalachia where buttermilk biscuits are a staple and everyone thinks their Mamaw’s biscuits are the best. These are very good but they aren’t Mamaw’s biscuits. I could only find milled flaxseed in my grocery store so that it was I used. The flecks of brown were one thing that was off—there are no brown flecks in a Southern biscuit. I almost left this out but I wanted to try the recipe as is. Can this ingredient be omitted entirely or is it necessary for a binding agent? Also, a tip for incorporating butter—grate it into the dough with a cheese grater. This is easier than using a pastry cutter to incorporate. Again, excellent recipe and I will make again. Thanks so much for your feedback! 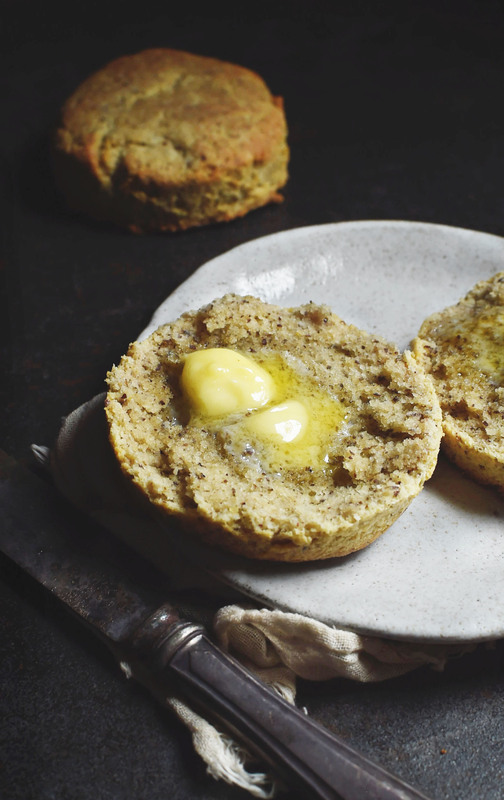 I think it would be hard to make a low-carb, gluten-free biscuit that could beat Mamow’s! I do really love the flavor of these, though. You’re right that the flecks come from the flaxseed. I think the flaxseed really helps make the biscuit. It makes them taste more like biscuits made from “regular” flour. I have made similar biscuits without, and found the flavor to not be quite as good. While flax seed does act as a binder, I think the dough would probably hold together without it. Thanks for the tip on the butter! I’v never tried using a grater for this! Is it possible to omit the xanthem gum? We are not suppose to eat that ingredient. In this recipe, the xanthan gum acts to hold the dough together like gluten normally would. The flax seed probably helps with that as well, but I’m not so sure it will do the total job. You could try a batch without and see how it goes. I too have a question about the xanthan gum – is it in powder form? In India it comes in small rock like clusters and it is soaked before using. Please let me know. Thanks. Xanthan gum is available here in powder form. When I use it, I usually mix it in with the dry ingredients before the wet ingredients are added. Are you still in India? Here it is available in health food stores and I am seeing it more and more in the baking section of regular supermarkets because there is more demand now for gluten-free baking products. How big around should they be. I just made them and they smell delicious. In the pictures they seem a fair size with some thickness so able to split. I hope you enjoyed them! I think they are about 1/2 inch thick or so when I make them. They don’t rise a lot, so whatever thickness you roll them out to be will be the final thickness. The thicker you make them, the longer they take to bake. If you get them too thick, you run the risk of getting the bottoms too brown because they take too long to cook through. Wow, as a told my husband, if i hadn’t made these myself, i would have thought they were made with wheat flour . As we are gluten free (celiac) and now low carb, I have searched for 4 years for a good biscuit recipe, and this is it. I just patted into a square, and sliced into 4 pieces. They even raised enough to split for a hunk of butter. Yum. Thanks so much for your feedback! You have really made my day! When I first made this recipe, I had a feeling it would be special before I even put the biscuits in the oven. Harper and I were sniffing the dough marveling at how much it smelled like “real” biscuit dough. I love the idea of patting it in a square and cutting it into 4 pieces. What an easy way to make biscuits! Thanks again! I’m going to be making these biscuits this morning. Can’t wait to try them. Can I use a food processor to cut in the butter? On another note, where in NC do you live? I am in Chapel Hill. I haven’t used a food processor for this, but I don’t see why it wouldn’t work. I live in Monroe, NC, which is south east of Charlotte. My son just started at UNC-Chapel Hill this fall. He absolutely loves it there! Let me know how the food processor works. I hope you love the biscuits! Hey Betsy I live in chapel hill did you try the biscuits? I just started a low carb diet and felt like I was having to give up everything good, except meat! I just tried this recipe, and these biscuits are amazing! They have a slightly different texture than regular biscuits, but they are the perfect combination of crusty outside, soft inside and have an excellent flavor. I will definitely double the batch so I can make breakfast sandwiches during the week. Thank you for a recipe that delivers a high quality, great tasting result. You’re welcome! This is one of my favorite recipes on the blog. They are so easy to make and taste like the real thing. Thanks so much for your kind words! I live in the foothills below Blowing Rock. Has anyone tried using plain Greek yogurt instead of sour cream. I am not supposed to have dairy except grass fed butter and Greek yogurt. I did make them with the sour cream to try and my husband said they were better than my traditional ones with White Lily flour. Let be your blog! I love Blowing Rock! How lucky for you to live nearby! I haven’t tried it with Greek yogurt, but suspect it would work. I would try it with a full fat variety and maybe make half a batch, just in case it doesn’t turn out. The flavor may be slightly different. Let me know how it goes! Better than traditional Southern biscuits made with White Lily flour is high praise indeed! Thank you so much! Thanks so much, Courtney! I almost always make a double batch of these. If there happens to be leftovers I keep them in the fridge and eat them for breakfast in the morning. Of course, leftover biscuits are a rarity in my house. I actually have used this recipe to top a chicken pot pie. It came out great! Good luck in your keto adventure! Topping for a chicken pot pie? What a great idea! I’m supposed to eat fewer whole eggs so Donna’s comment from Feb 15 is right on target! Reading all the comments is a great way to pick up new ideas! These are so good! Not that the recipe needs improvement, but have you tried it with two egg whites for a fluffier biscuit? Thanks so much, Donna. I haven’t tried them with two egg whites. Have you? I’m all for a fluffier biscuit! For those of you wondering about the xantham gum…. I made the first batch without the xantham gum, then made a second batch with the xanthan gum. I’ve been gluten free for 9 months and these are definitely the best biscuits I’ve made and possibly the best bread I’ve made. There was no difference in taste or appearance between the xanthan and the non-xanthan biscuits. Without xanthan gum, the biscuits are more crumbly. This was not an issue for me since I had them with sausage gravy. If I wanted a biscuit to eat in hand, I would definitely use the xanthan gum. It does help the biscuits hold together better. They still aren’t as sturdy as a wheat four biscuit but there is a noticeable difference. What a great comparison with and without xanthan gum! Thanks! What can we use instead of almond flour and flax.Unfortunately I can’t have any.I do have some white chia seeds and psyllium husk.Was wondering if any of these will work. It may be a bit much to try to replace both the almond flour and the flax seed in this recipe. Instead, you may want to search for a different recipe using whatever flour works for you. I would hate for you to make substitutions and not be happy with the final results. What can be used in place of the xanthan gum? I have tapioca flour/starch, but I wasn’t sure if it would work. I really want to try these right now! The xanthan gum helps replaces gluten. It could probably be replaced with guar gum, but I haven’t tried this. The may work without it, but won’t puff up quite as much. I made these biscuits last night – and I”m making them again tonight at the request of my husband. We’ve been low-carb for two months, and we’re doing well with it, but we miss some of our favorite foods. Mine in particular is biscuits and gravy. I had to make a few small changes, but we loved them so much! I had no xanthan gum, so I used an additional egg white – they held together just fine! I was able to cut and put butter in the middle. I also didn’t have ground flax seed, but did have whole. I pulsed the seeds in the food processor and was able to grind them up slightly. I loved the taste. They remind me heavily of whole wheat biscuits. I also made them completely in the food processor – using frozen butter helps with “flakiness”. I made drop-style biscuits instead of rolling out and they were so easy all around and a wonderful addition to our new way of eating. Thank you so much for your work! 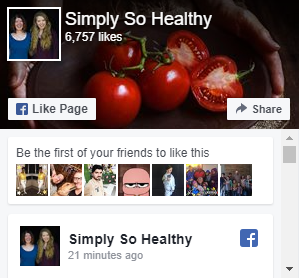 I’ll be back for more recipes! You’re so welcome! They remind me of whole wheat biscuits too. Thanks for sharing your alterations. It’s always good to see what works for others. 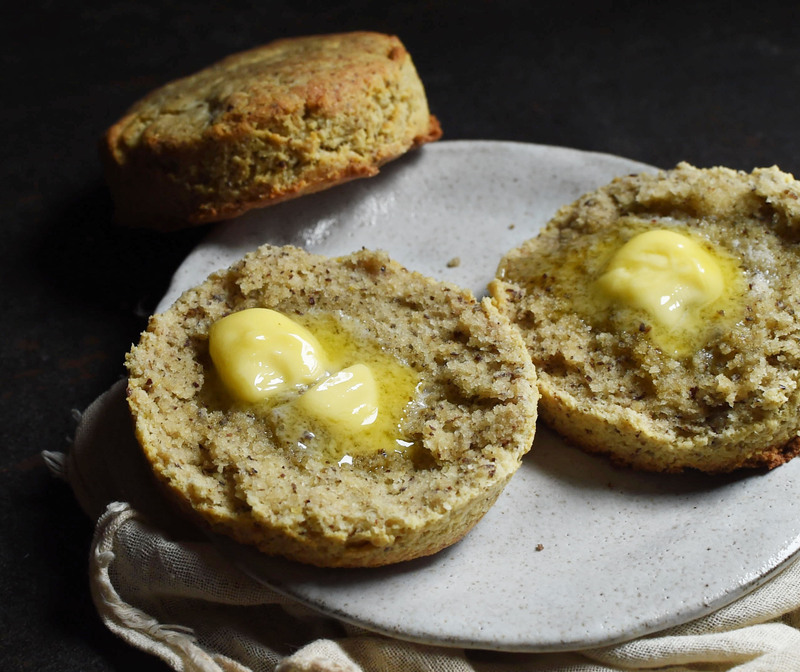 These were outstanding and I have made A LOT of low carb breads and biscuits…..this one is definately the closest to a Southern biscuit. My biscuit cutter was a 3 inch size and I would recommend not going above 2 1/2 inches (diameter) as these biscuits are more fragile than a standard wheat flour biscuit. Mine crumbled a bit when I split them….I think slightly smaller should work fine. Also for the butter: what works for me is taking a frozen stick of butter out of freezer (I always freeze mine for longer shelf life) and let sit while I measure out the other ingredients. I mark off the # Tbs I need with a knife, peel the paper down to the makings and GRATE IT on a mid size rasp grater straight into the mixture. Then just fluff into the dry mixture with a fork. Gives a really even mix without the need of cutting in with pastry blender. Works great. These were such a treat….going to be a Sunday morning brunch favorite for sure. Good to know that the psyllium husks worked! Thanks for the review! Wow! These are amazing! I have probably made 4 quadruple batches in the past two weeks. I just went through my recipe notebook and culled SEVEN other biscuit recipes and dropped them into the recycling bin. Obviously, I’ve been on a hunt for a yummy low carb biscuit for a while. The other ones were okay, but these taste like the real deal! Even my picky kids loved them! They usually hate anything low carb (and they’ve tried a lot of them!) I usually end up making the white flour ones for them, and the low carb ones for us. No more! I can make one huge batch, and all six of us are happy! These also taste great with crumbled sausage and shredded cheddar cheese mixed with them before baking. Thanks for sharing this recipe! It’s our go-to recipe now, and my search is over. Thank you! Thank you! Thank you! This is one recipe on the blog that doesn’t get the traffic it deserves. If Pinterest offered a tasting feature, I know it would be much more popular. Glad you enjoyed it! Thanks! I’ve always felt like this should be one of the most popular recipes in the blog. If only I could let people taste them online, they would be. These have been the best low carb biscuit I’ve made yet!!! Didn’t have flax, so I left that out. They didn’t rise like the picture, but I think that’s due to my old baking powder. Delicious though!! Boyfriend approves, and loves that he can still eat biscuits and gravy on keto! Thanks for your feedback! I think I rolled them out so they would be particularly high for the picture, but old baking powder probably didn’t help. I’ve made these biscuits several times and I can say that, even as someone who doesn’t have food sensitivities, they are delicious. I just eat them by choice. Haha. They were so good dipped in my homemade stew, and their great on their own with butter! Thanks so much, Dana! I really appreciate your feedback! Wow, these look awesome. I love making Southern biscuits, but they are loaded with carbs and since we’ve been trying to cut back, I haven’t been preparing them nearly as much. Now I can! I am very excited to get into the kitchen and makes these gems. Thanks for the great recipe and the inspiration, too!! You’re welcome! 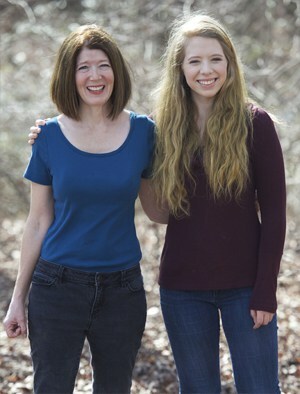 I may be biased, but I think they tasee awesome, too! Wow – thank you for all of your hard work to make these! I can’t wait to make these for my friends who are low carb!! Really, I should be eating low carb, too, but I just haven’t been able to yet! Maybe these will change my mind and show me it wont be so bad after all! I’m so glad that amazing low-carb and gluten-free biscuits are possible! It’s such a journey trying to find foods you love which can sub for the ones you can’t have anymore. Thank you for doing all the hard work in figuring out just the right mix of ingredients! Ladies, Congratulations! You’ve developed a recipe for a keto biscuit that could pass as a conventional one. I’ve made the recipe twice. First time I used the food processor and can say that the process does work, but one must be careful not to over-process the dough. It only takes a few pulses. I even forgot to add the ground flax seed to that first attempt and the biscuits still came out good. Made them for the second time this morning using the method of grating frozen butter into the dry ingredients and mixing by hand using a large fork. I remembered the flax this time, too. This batch is even better than the first and looks flaky just like a conventional biscuit. I double the recipe, pat it into a rectangle, and cut it into 9 large portions. Thanks for adding your experience with the food processor and not using the flax seed. I’m going to have to try grating frozen butter.That sounds like an awesome idea. Good luck on your low-carb journey! I must say, I appreciate your efforts! I agree with you about almond flour – I love it, but it’s obviously not the same thing as wheat, and there are just too many gluten-free recipes that seem to take a sort of ‘ehhhh good enough’ approach. The added flax and egg make perfect sense, and these look great! Cheers. Everyone has an opinion about biscuits — especially the Southern style biscuit. 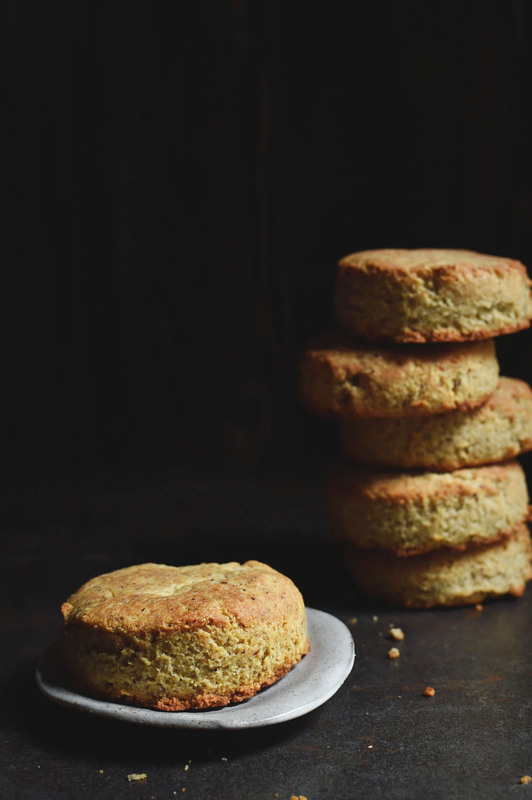 Now, if you need a low-carb and gluten fee biscuit I think this recipe is ideal. People who can’t have the regular kind of biscuit can enjoy their delicious bread along with their gravy or just butter. My first attempt at this recipe today, following your recipe as written. I have made a Keto garlic-cheese biscuit so far, but wanted a good, plain biscuit recipe in my collection. I think this one is it! I did find the “dough” to be very dry, crumbly, but it came together in a dense ball with a few kneads, before patting it out & cutting it into 4 pieces. I was a bit concerned at that point that they would come out of the oven dry & crumbly, but they didn’t! I let them sit a few minutes, while I finished making our eggs, then split them for pats of butter (& jam for my son!). They held together nicely. The golden flaxmeal gave them a bit of a cornmeal taste/texture, which I’m not sure about yet. But otherwise, they were satisfying! Thank you! You’re welcome! Other people have mentioned that they have left out the flax meal with good results, so that might be an option if you don’t care for the taste. Thanks for this awesome biscuit recipe. I like using almond flour in baking and always looking for new inspiration. These will be perfect for a game day to go with chili. Yes! They would be amazing with chili! Just made these for the first time! Very satisfying & fills the Keto plain biscuit spot for me. I thought the “dough” was very dry & crumbly after mixing all the ingredients together, but a few kneads brought it together into a very dense dough. They came out well–splittable for butter & jam, and held together to eat! Now, I may try adding a 2nd egg white with the next batch & see how that changes the dough. Thank you for a good, easy recipe! I was so surprised to read how little these biscuits rise! Looking at them I assumed that they rose like traditional biscuits because they look so fluffy and large. The beautiful texture and color that the almond flour gives these makes them look so much more appetizing than traditional biscuits as well. Ooooh that melty butter on that golden biscuit… I want to reach in and have one with my coffee! These sound absolutely amazing. I’ve only used flax a few times, but it’s been a game changer for baked goods in our house. Amazing recipe! I’ve yet to see a gluten free biscuit that looks as fluffy as a gluten FULL biscuit. This one comes pretty darn close. Crumbly gluten free baked goods are a pain, so I am happy that you solved that issue with the flax and egg white combination. Thanks so much!These are my favorite biscuits ever. These were perfect! Only change I made was to use bacon/sausage grease from the gravy I made these to go with jnstead of butter. I no longer miss biscuits! Thank you! You’re welcome! I love the idea of using bacon drippings! Coconut flour acts very different from almond flour, so I would suggest trying a different recipe if this is what you need to use. Good morning from north Louisiana! We are in our late 50’s so we know what Granny’s biscuits taste like and honey you knocked this out of the park. THANK YOU. Thanks so much for your kind words! You made my day! New to low carb eating, these were great for me and my husband. I took I one more step and added 1 RS dried garlic and 1 ts dried Italian seasoning for an incredible savory biscuit! Yum!!! Yay! Glad they hit the spot!